Within motorcycling circles, Louth is probably best know for its close proximity to the famous Cadwell Park road race circuit. 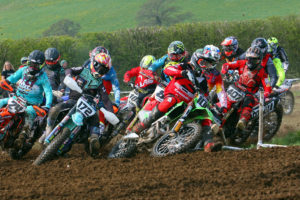 However, at the weekend it played host to LEC’s latest enduro, with round 7 of their 9 round championship. Taking place at Legbourne village on the outskirts of the market town, the club has worked tirelessly for a number of weeks on a brand new course which has never been used for competition before. Fast flowing stretches of farmland and five separate wooded areas were utilised to gain a lap of a little under 5 miles. Conditions that had been described as slippery in the first race were made worse by summer showers just before the start of second. The change in conditions seem to have an affect as some of the 104 riders fell by the wayside in race two. With two rounds to go, only one person has got both hands on a class trophy and a guaranteed championship win. Tara Hollingworth in the ladies section has wrapped up the title in that division already, and cannot be caught. Neil Tapper (Over 50’s) is the only other rider in any of the other classes to have a perfect 100%. Neil’s crown nearly had a dent put into on Sunday though. In a first corner “racing incident”, Neil and several others were left inspecting the grass at close quarters as their opponents escaped into the distance. He did however fight back and eventually reel in nearest rivals Andy Jackson and Kev Bartle (S) to keep his perfect run of victories going. Other class favourites look to be Steve Langley in the Trail group, George Birchall in Experts, Oli Moses in Clubmen and perhaps Gareth lodge in the over 40’s class. One class that definitely isn’t certain of an outright winner just yet is the Sportsman group with both Daniel Harris and Mark Lonsdale level on points at the top of their league. event is probably the most eagerly anticipated one of the year as LEC has already started course preparation, and have shoehorned an “Extreme” section into the proceedings.